Here is Part II of our end of year mailer. Thank you again for all your support! A planned two-day Labor Day live pigeon shoot that was to be held at the Wing Pointe canned hunt club in Berks County, PA, was cancelled due to lack of shooters! SHARK has documented horrific cruelty at Wing Pointe's pigeon slaughters for the past 6 years. We’ve released dozens of videos that have received millions of views and documented both pigeon shoots and tower shoots, where pigeons, pheasants and chukars are hand-thrown into the air and shot for fun. 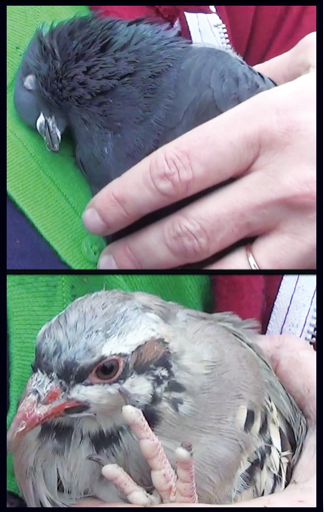 We’ve rescued more pigeons than we can count, including two chukars who were taken to a sanctuary. 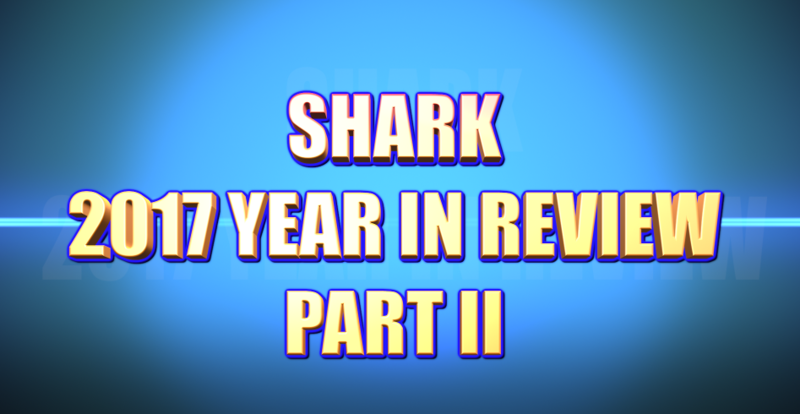 Our victories at Wing Pointe have been met with anger and violence from its supporters; SHARK investigator Janet Enoch was physically assaulted by a shooter as she sat in the SHARK van, and I was hit in the head with a metal dog chain and left bloodied. I was also intentionally hit by a van during a shoot, and a worker for the owner of Wing Pointe held SHARK Investigator Janet Enoch and myself at gun point after one protest. This is how desperate and disgusting pigeon shooters are, but while others have backed away, we did not and we never will. As we continued to expose Wing Pointe's shoots and the thugs who participate in them, we witnessed a dramatic decrease in attendance of shoots at Wing Pointe. The point is, the cancellation of the two-day shoot was no accident. If not for SHARK, this shoot would have happened and thousands of pigeons would have died. SHARK is elated to announce that legislation to place a moratorium, until July 2019, on vile cownose ray killing contests in Maryland, was signed into law this year. This is a monumental victory that only happened because SHARK was at the contests, putting ourselves at risk to document the cruelty and expose it to the world. Thanks to SHARK’s hard work, these shameful slaughters have been shut down! 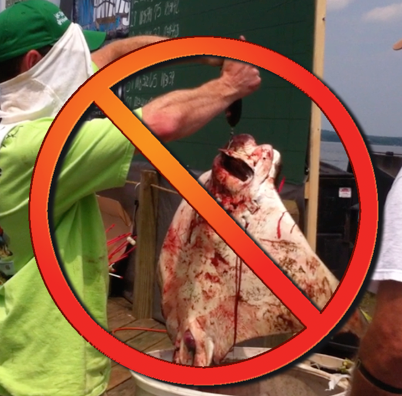 After being contacted by Fish Feel, a Maryland-based fish advocacy organization, SHARK filmed cownose ray killing contests on the Patuxent River in 2015, and 2016, where pregnant rays are shot at point-blank range with arrows and beaten with metal bats. Our video of the 2015 contest was so powerful and received so much attention that two of the three ongoing contests shut down! The third contest, sponsored by American Bowhunters, defied the public will and held a contest in 2016. This proved to be their downfall for the drone video footage we recorded of that slaughter was so horrific that it caused international condemnation of these killing contests, and was the catalyst for the Maryland Legislature to take decisive action. Many of the animals killed in these contests are either pregnant or have recently given birth, so it isn't only the mothers we have saved, but their offspring as well. The many thousands of dollars and hundreds of hours we dedicated to this issue have yielded a great victory with the three year moratorium while we will continue to push for a complete ban on these killing contests. Without SHARK’s hard work and our graphic video, these majestic animals would have received no sympathy, no hope, and the merciless slaughters would have continued unabated. But because we chose to stand and fight for theses rays, untold thousands of pregnant animals and their children will be spared a violent death. We sincerely want to thank animal protection heroes Bob Barker and Nancy Burnet for their support, for they made our boat, the Bob & Nancy, (see picture above) our drone cameras, and so many more things possible. 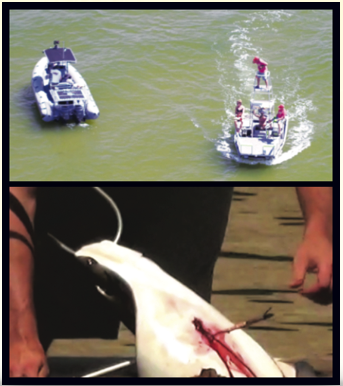 Our boat and drones were a major reason why we were able to stop the merciless cownose ray tournament slaughters. 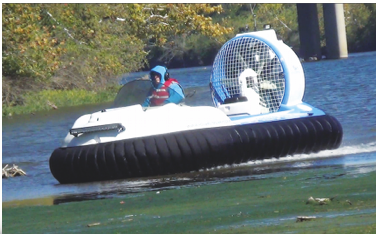 SHARK is also pleased to introduce you to our newest tool for water-based campaigns: The Osprey (above), our new hovercraft, will help us enormously in rescuing wounded animals. The next time a natural disaster, such as a hurricane, strikes, we will be able to save lives using The Osprey, because hovercrafts can operate seamlessly on land and the water.